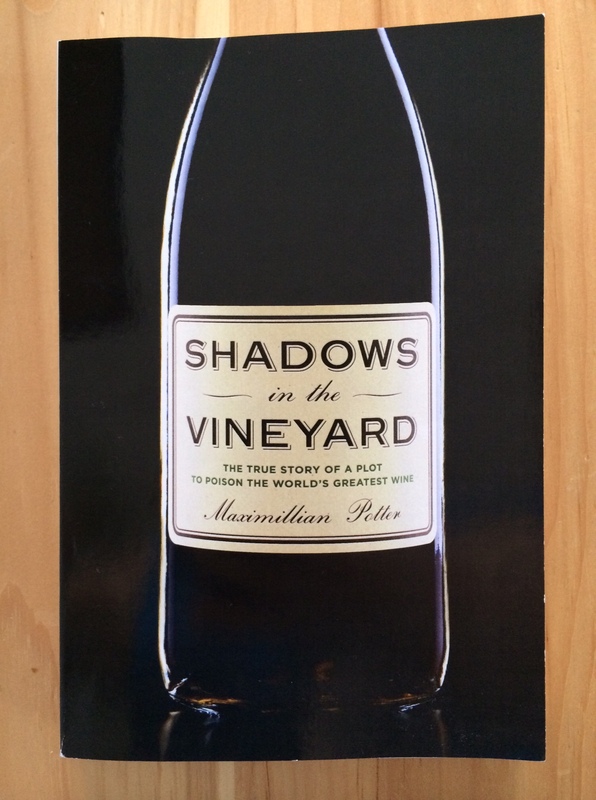 The subtitle of Maximillian Potter’s Shadows in the Vineyard* is “The True Story of the Plot to Poison the World’s Greatest Wine,” which conjures up images of ski-masked men in dark cellars lacing bottles of wine with cyanide or arsenic. The truth is somewhat different; a more accurate subtitle would have focused on the vineyard and the vines that produce one of the world’s most expensive and highly-regarded wines. While no cyanide appears in Shadows in the Vineyard, two vines in the Domaine de la Romanée Conti vineyard were indeed poisoned, and the man who did it threatened to poison more. These events were the subject of a Vanity Fair article penned by Mr. Potter, which was then expanded into this book. Earlier this summer I reviewed Ray Walker’s The Road to Burgundy, which is one man’s tale of leaving it all for the love of terroir. Shadows in the Vineyard is more invested in territory, in how this famous vineyard came to be, in the forces that shaped both winemakers and winemaking. The organization of the book leaves much to be desired; Mr. Potter attempts to build tension and flesh out a short true-crime story by coming back to the poisoning plot time and again even as he digresses into other subjects (history, the wine market, tensions among the DRC’s owners, etc.). A better strategy, I think, would have been to frame the poisoning plot as just one of the many challenges the vineyard has surmounted over hundreds of years, and using it to bookend his study of Aubert de Villane and his vineyard. Still, there’s much to learn, and if you’re a wine connoisseur, you won’t want to miss this book given its focus on vineyards and the history of burgundy wine (especially the Domaine’s). For the rest of us mere mortals, who will probably never taste a wine valued at thousands of dollars a bottle (really: check out this Sotheby’s auction listing), Shadows in the Vineyard offers carefully drawn portraits of Monsieur de Villane (though I rather wish the author would not purport to know exactly what the man was thinking at such-and-such a moment), his family, and even the vine-poisoner. Mr. Potter, and many others, consider the best kind of wine to be a consumable work of art, a da Vinci painting, say, in a glass; what would drive a person to deface that kind of beauty? If you’re interested in the question, you might like Shadows in the Vineyard. *I received a copy of this book from the publisher for review purposes, which did not affect the content of my review. Another of that regrettable genre — the magazine article that thinks it’s a book. I think the author held on too hard to the article; if the organizing principle had been different (i.e., Here’s a history of the DRC), the book would have been better. Great analysis! I guess I have to read the book to find out why the vines were poisoned. Or I could email you . . .
Oh, yeah. Do that! You’ve got it, right? I somehow don’t want to post it on your page, since it’s a state address.